I’ve been blissfully enjoying my new home for oh, about a month or so now. Thanks to hurricane Hermine Austin has had severe flash flooding. Fortunately our house is NOT under water, but due to the constant torrential downpour all day yesterday and throughout the night, I’ve not got some problems going on in the house. I guess you could say the honeymoon phase is now over. My laundry room flooded. Like, a LOT. Lots and lots of water all over the entire room. Thankfully it was only the laundry room with tile on the floor and not somewhere with carpet. The vent apparently has a leak on the roof because water came in through it and into my laundry room. It also went inside the vent hose and into my dryer, but I think the dryer is okay. This is the vent that the water came in from on the roof. WHO do I call to fix this? A Plumber? A Roofer? A who-knows-who? Obviously I need this fixed as soon as possible. Rain is forecasted throughout the rest of the week. I put this bookshelf together Saturday. I hadn’t even posted about it yet. And the flooding in the laundry room has now ruined it. The dryer hose is wet on the inside, so I had to hang it up to dry. Our closet ceiling is wet. REALLY wet. There was water damage there before we bought the home, so we knew there was an issue at some point. But we were under the impression that this issue was fixed and that the previous owner never fixed the sheetrock. WRONG with a big fat W! That bag under the ceiling is dripping wet. Fortunately it caught most of the water and saved my husbands wardrobe. But obviously if the sheetrock looks like that then there’s probably a LOT more damage inside the walls. Who do I call for this issue? Can the person who fixes the vent leak on the roof fix this issue as well? I’m feeling kinda desperate right now. Hubby is out of town for business so I’m left to deal with this on my own. And as the rain continues to come down, the problems are only going to get worse. If you have any ideas of how I should handle this flooding situation, PLEASE pretty-please leave me a comment and tell me what to do! Thanks in advance. Y’all are great. First off, THANK YOU for the huge outpouring of advice. I so appreciate every bit of it! I called our Home Warranty – they do not cover roofs. I called our Insurance (Allstate) – our deductible is over $3k (yikes!) so we aren’t going that route either. I left a voicemail for a roofing company. Still waiting to hear back. 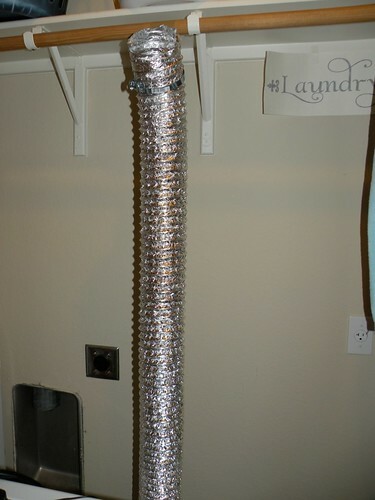 As for the dryer vent – it is vented to the roof. I’m assuming the cover must have come off. The water is coming from inside the vent, not around the vent, so I think it’s just filling up with the rain water. I’m thinking there isn’t a leak, but just needs a new cover. Hopefully. I could go fix it myself, but I refuse to climb onto a 2nd story roof. I’d rather NOT fall and die. Thanks, but I’ll call a roofer for that. I’m about to go cut out all the sheetrock in the closet to assess the situation. I’ve done sheetrock in the past HERE and HERE so I’m pretty comfortable working with it. Ivy suggested (in my comments) to remove the sheetrock so I can better assess the situation. Great advice! That’s exactly what I’ll do. Thanks Ivy! * The house was a foreclosure, so we bought it as-is. * When the inspection was done it hadn’t rained in months. The leak(s) were overlooked I suppose because how would they have known anyway? Call a plumber and look at your house papers and that form…the “real estate condition report?” by law they should have provided you with a list of things in the house that got fixed, or didn’t! Your insurance company should be able to tell you where to start. Our first floor ceiling started leaking a few months back and we did not know if it was roof or plumbing. I called them to ask and they sent someone out to check it all out, then we could decide if we wanted to make a claim or not. While we did not make a claim, it was nice to ‘use’ the insurance that we pay for but never really use..thank God. Good luck. Stopping the leak is # 1 on the list! You can’t do any other work to fix the walls if you dont’ fix the leak. If you can’t get a general contractor who knows (or can contact) people for you, then I would start with a roofer. 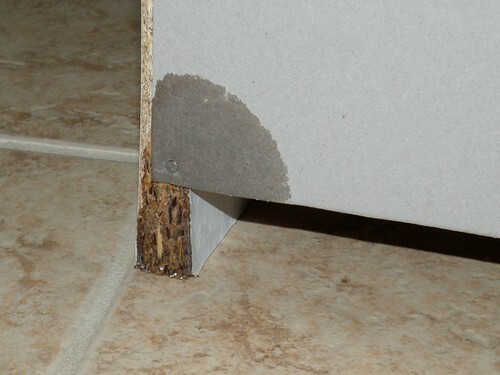 Should be a free estimate and can tell you where and how bad the damage is, cost to repair etc. The drywall you can fix on your own if you don’t mind getting messy, but if there was orignal damage you may be looking at a mold issue. I would look at your purchase agreement real close, where I live water damage has to be fixed and inspected and listed as to when, where and who fixed it as well as a non-mold assurance. If not we can make the previous owner to get it fixed. You might have the same option. If you want you can try ripping out the drywall. Clear out the closet than hit the dry spot with a hammer to form a hole then score around it with a drywall knife and pull it out. It is messy and dusty but you can then see where the leak is and at the very least plug it or catch the water until it can be fixed. Most likely the roofer will have to do this as well and the drywaller for sure will have to so it just saves time. Good luck. Water damage isn’t fun and as will everything take pictures and get everything in writing. If it is a costly repair then file with insurance, if not then it is worth paying by yourself. Otherwise even a little claim can make your insurance premiums go up, plus you would have to cover any deductibles as well. Ours went up 200 a year to file a 500 claim to get the tile cleaned after our water damage. Lesson learned. I’d start with an insurance agent too. While it might not be covered and they might not be able to stop the leak, they would know who to call. So sorry this is happening to you! Do you have a ServPro in your area? That is who helped us when we had flooding in our home. They can determine the extent of the damage as well as begin the repair and restoration process. 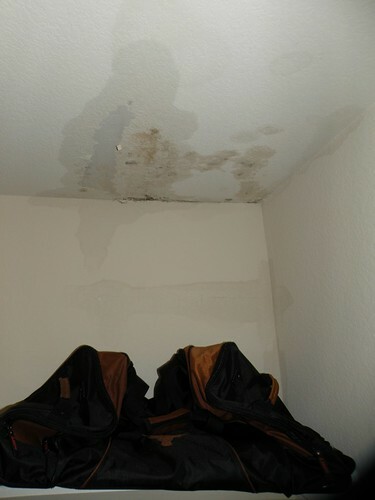 Water damage is their area of expertise. 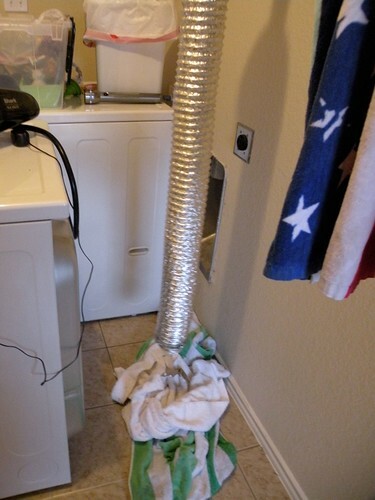 First, is your dryer vented through the roof or out through a wall? Raining into the vent (cover may have been blown off) or pouring in because the ground water level is high will be good to start so you can tell the person you call. – this is really a contractor/builder issue. It’s a structure/design issue (not a drain or a water pipe issue) a plumber would most likely refer you to someone else. 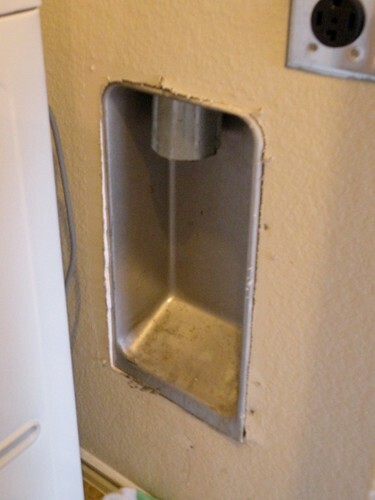 And it could be a simple a fix as replacing the flapper on the dryer vent outside. – Take photos, keep receipts of anything related to the cost of cleaning, repairing, replacing. You are a new homeowner, I would contact the realtor who sold your house. This may be a situation of undisclosed issues, it wouldn’t be the first time I’ve heard of this. And having the receipts and photos will help if you file an insurance or realtor claim. – If you need anything, just give a shout out. We have a variety of occupations going on in this family to lend resources. Email me if you like. I would call the realtor-they have insurance for these things..if there was non-disclosure of the problem…or made you to believe that it was taken care of. Oh, Allison! 🙁 Rough week! I’m sorry to hear bout your flooding. My family owns a plumbing company — and so MY suggestion would be to call someone who does HVAC – most plumbers will do this, sometimes heating and air people do it as well. They can fix the venting issue. I’m at a loss for the roof leak — sometimes if you call the right plumber/technician they can refer you to someone or will do the repair themselves too. Then I would call a restoration company — a lot of times they work with your insurance company in the event of water damage or leaks and get the mess cleaned up and repair/replace any walls, ceilings or carpets and then have your insurance pay. And one last ramble — Do you use Angie’s List?? It’s a good way to find a good, reputable company/person to do the repairs — I’ve always had great luck finding someone that way. Good luck! I hope it all goes smoothly!! Yikes!! Perhaps one of your neighbors can recommend repair people as well. Good luck! omg, in the time it took me to be at work, this is what’s been happening?? My sympathies may be belated but are just as heartfelt. And I am so-o impressed with your detective skilz (and willingness to investigate the attic — I still haven’t in my home). Good luck!